Both sides were now seeking support from near and far. 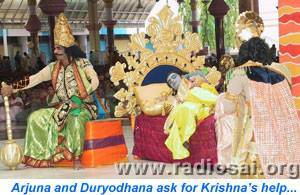 Both travelled to Dwaraka to seek the help of the king, Sri Krishna. Duryodhana , waiting for him to rise, sat near his head. To sit in respectful patience at Krishna’s feet. It was the pious Arjuna at his feet that he happened to see first. His army he offered to one, and to the other his non- combatant self. Duryodhana who got the army was foolishly in delighted excitation! That the death knell had already started sounding for the Kauravas.